Found between the ribs and the belly of the pig, the galmaegisal, also known as “pork skirt meat”, comprises only 250g of every full-grown pig. Korean barbecue joints are becoming a dime a dozen in a city like ours, so what makes new Korean restaurant Seorae Galmaegi so special? That was the question I had in mind as I entered the cosy 2,300 sq ft restaurant, which featured retro-style wall murals channelling 1970s Seoul. 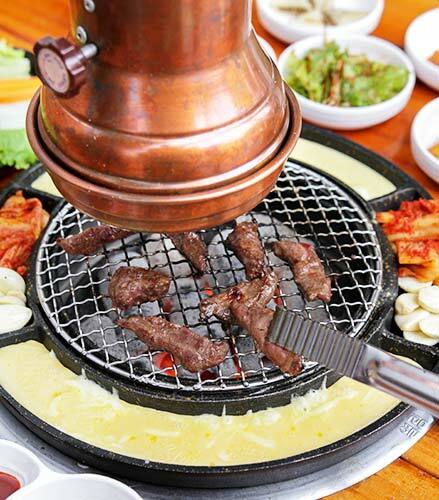 First of all, Seorae Galmaegi is the first restaurant of its kind in Singapore to offer a unique cut of meat called galmaegisal — served exclusively to royalty in the past. Found between the ribs and the belly of the pig, the galmaegisal, also known as “pork skirt meat”, comprises only 250g of every full-grown pig. For its supposed scarcity, I was expecting a hefty price tag attached to it and I was surprised to find that the prices start from $21.90 for a portion of the galmaegisal meat. Our meal kicked off with a spread of banchan (Korean small dishes), which was quickly forgotten about as soon the grill started smoking. A designated member of the staff tended to each table, skilfully cooking the slices of galmaegisal to perfection with a special “circle grilling” technique — talk about a royal experience! Don’t forget to dip your grilled meat into the moat of cheese and tofu. Served piping hot and charred at the edges, the cubes of galmaegisal had a juicy and tender texture that resembled Wagyu meat but was less unctuous. The meat was flavourful on its own but especially tasty when dipped into the special piquant onion sauce. Apart from the galmaegisal, the La Galbi short ribs ($38.90), as well as the Three Musketeers ($31.90) — which consisted of original, sweet and spicy pork belly meat — were worth a try as well. The ‘moat’ surrounding the grill was noteworthy and held bubbling cheddar cheese alongside silky smooth tofu. It was certainly an intriguing sight. More often than not, I found myself dipping slices of meat into the cheese before polishing off the entire gooey morsel with great pleasure. 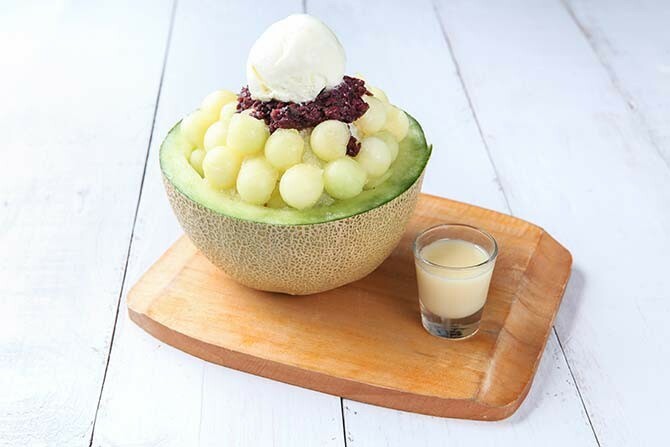 Cool off with a satisfying and pretty patbingsoo dessert. 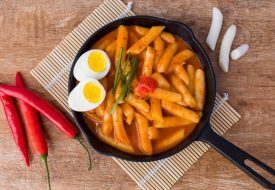 To cool off after gorging upon the grilled food items, you could order one of Seorae’s signature Yakult sojus, cold noodles, or a patbingsoo. For novelty’s sake, we ordered the Bibim Patbingsoo ($12.90), a bibimbap look-alike that tasted like a mash-up of finely-shaved ice with fruit. It was pleasant but not as memorable as the Abgujeong Bingsoo ($14.90) — a cheesecake-themed creation, which sent us to dessert heaven with each salty-sweet spoonful. 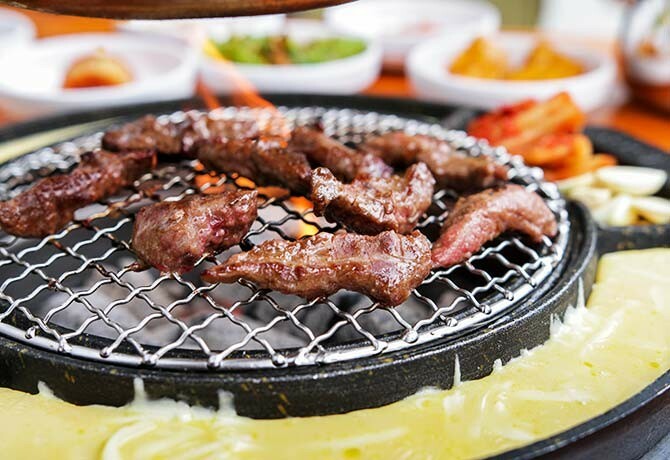 For uncommon grilled meat and sweet Korean treats, I wouldn’t mind returning again in the not-too-distant future. A version of this article appeared in the print edition of Weekender, Issue 148, March 18 – March 31, 2016, with the headline ‘A special cut for BBQ’. Previous PostSingapore Airlines Hires Their First Female Pilots Next PostIt’s Free Cone Day!